Christmas is a time spent with the ones you love — be it family, friends, coworkers, or pets! Today let’s take a walk down memory lane as I share some fond memories via a Christmas flashback. Quite honestly, there isn’t really one memory in particular that comes to mind when thinking about Christmas. For the last few years, however, my family has been pretty spread apart — my brothers in Florida, my mom in South Dakota or Georgia — so getting together for holidays has proven quite tricky. Add in the fact that my fiancé and I alternate Christmases and you’ve just thrown an entirely new wrench in the Mooney family Christmas plans! Back in 2012 when my fiancé and I were mere babes, I traveled to England for my very first British Christmas. I wasn’t quite so sure what to expect, especially since all of the Christmas holidays I’ve experienced have been fairly unconventional and, well, American. Now, I’ve never had a White Christmas, so I was slightly disappointed that England didn’t deliver on Christmas morning like it did for Harry Potter during his first Christmas at Hogwarts. Honestly, I’m still holding out for snow this year. Nonetheless, it was so interesting seeing how another family operates on a major holiday. Everyone has their place — assembling nibbles, setting the table, decorating the tree, playing disk jockey, and even supplying a steady stream of wine right into my glass. My fiancé has quite a good-sized family, so there was always some sort of conversation taking place in the kitchen or a game of scrabble in the living room ending in tears. In just two weeks I’ll be traveling back to England for my second-ever British Christmas! And since I’m moving to the UK in February, I’ve already begun sorting through all of my belongings to determine what I should bring with me over the holidays. I’m really looking forward to spending Christmas with my fiancé and his family again, especially since we could both really use a holiday, but also because I miss hanging out with his huge family! Of course I’m going to miss waking up and bickering with my brothers as we unwrap presents together, but I’m looking forward to finding my place at the Papworth’s on Christmas day. 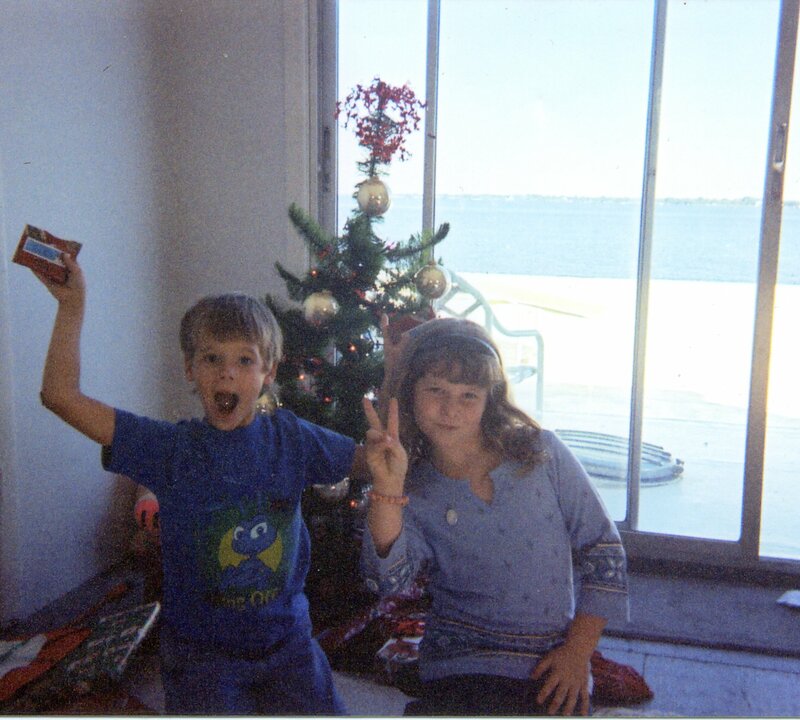 Oh, and in the spirit of Christmas Flashbacks, here’s a FABULOUS picture of me and my younger brother from Christmas ’99. I may or may not have been thinking “Girl Power” in this photo. Hint: I totally was.